Helping you connect with your audience by delivering timely event coverage for social media and websites. Welcome to my Events blog! Topics include event coverage, news stories and places travelled. You can also see my "out and about" social media activity by clicking on the icons at the bottom left of this page. One of several tracked vehicles participating in Exercise Maple Resolve at CFB Wainwright. On May 17, 2017, I was part of a military outreach group invited to observe approximately 6,000 troops doing force-on-force field training as part of readiness for operational deployment. Soldiers of the Royal Canadian Regiment based at CFB Petawawa, Ontario host a weapons display for civilian visitors during Exercise Maple Resolve at CFB Wainwright, Alberta. Chopper landing at Airfield 21, CFB Wainwright. Behind the imposing CH-147 Chinook helicopter (left), a CH-146 Griffon helicopter (right) is on final approach at the airfield. They were two of several aircraft assigned to Exercise Maple Resolve, a large-scale military training event with 6,000 troops, at CFB Wainwright until the end of May 2017. Military musicians play trumpets during The Loyal Edmonton Regiment concert on May 7, 2017 at the Brigadier Jefferson Armoury in Edmonton. Royal Canadian Navy Reservists with HMCS Nonsuch and Sea Cadets on parade during the annual Battle of the Atlantic ceremony on May 7, 2017 in Edmonton. A Veteran and sailor participate in the Battle of the Atlantic ceremony on May 7, 2017 at HMCS Nonsuch in Edmonton. Signing certificates during The Loyal Edmonton Regiment change of command ceremony on May 6, 2017 at the Federal Building in downtown Edmonton. (L-R): Lieutenant-Colonel Jonathan McCully, incoming Commanding Officer; Colonel Eppo Van Weelderen, Commander of 41 Canadian Brigade Group; and Lieutenant-Colonel kevin Weidlich, outgoing Commanding Officer. Officially handing over the Regimental colours during The Loyal Edmonton Regiment (LER) change of command ceremony on May 6, 2017 at the Federal Building. Lieutenant-Colonel Jonathan McCully (right0 icoming Commanding Officer, accepts the LER colours from Colonel Eppo Van Weelderen (left), Commander of 41 Canadian Brigade Group. Looking on is Lieutenant-Colonel Kevin Weidlich, outgoing Commanding Officer. The Alberta Legislature is in the background. I had the pleasure of covering the 43rd annual Rosies Awards, a celebration of the Alberta film and TV industry, on April 29, 2017 at the Shaw Conference Centre in Edmonton. The Alberta Media Production Industries Association (AMPIA), hosted the gala event that featured Michelle Thrush (pictured above) as the show host. 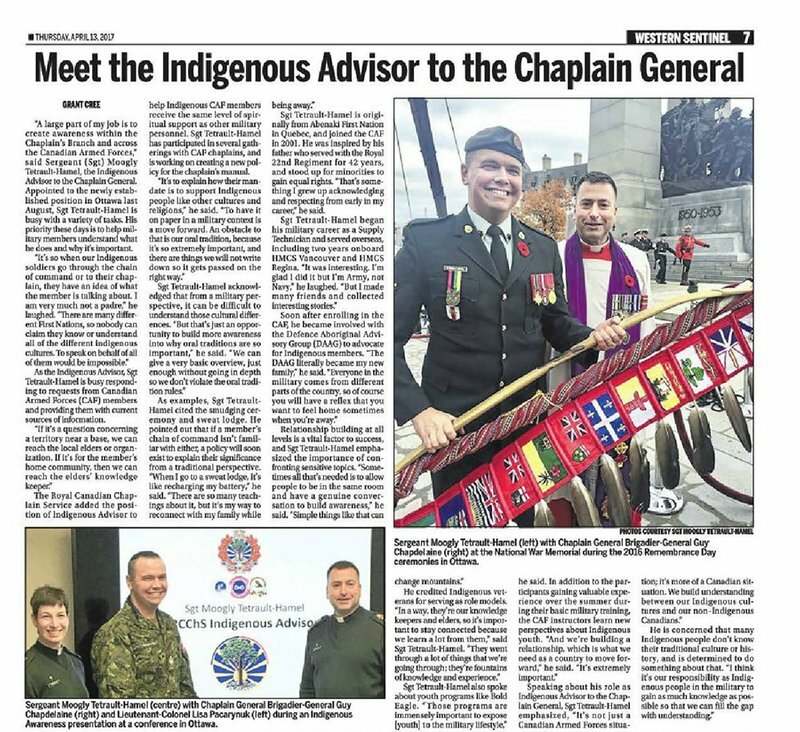 My story featuring the newly appointed military Indigenous Advisor published in the April 13, 2017 edition of the Western Sentinel military newspaper. To read this article, click the LinkedIn icon at the bottom left of this web page. 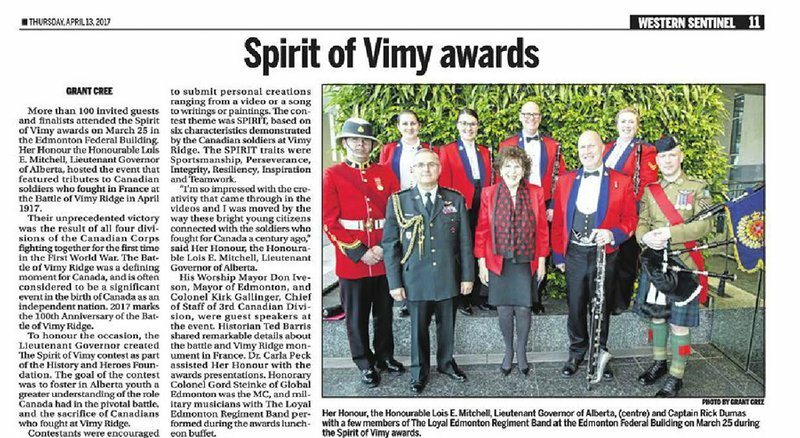 Alberta Lieutenant-Governor Lois Mitchell hosted the Spirit of Vimy awards to honour Canadians who fought at the Battle of Vimy Ridge in April 1917. Here's my story of that event published in the April 13, 2017 edition of the Western Sentinel military newspaper. 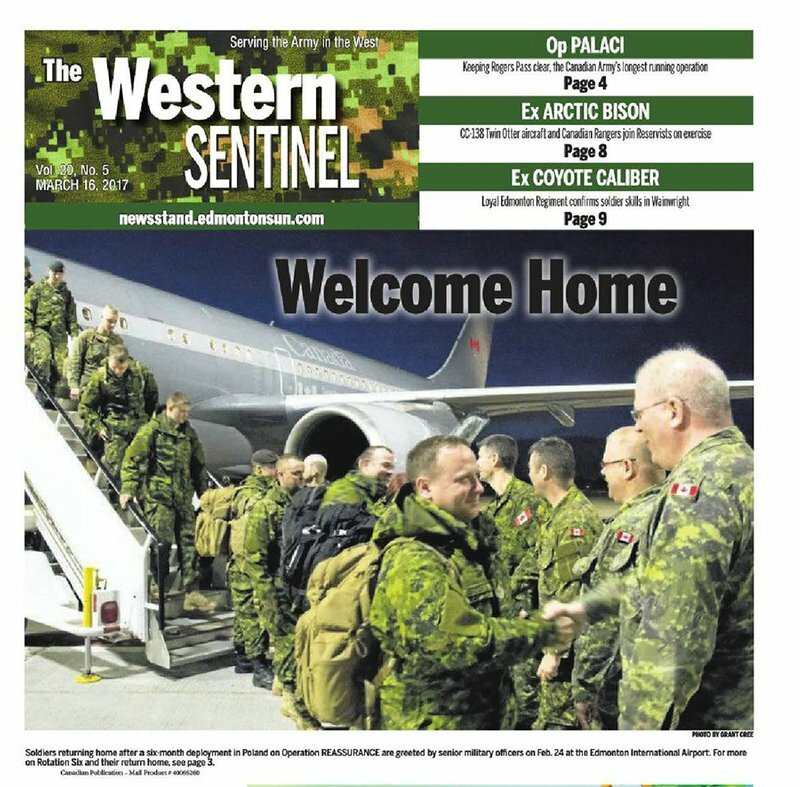 My troops arrival photo on the front page of the March 16, 2017 edition of the Western Sentinel military newspaper. My coverage of Jason Kenney winning the PC party leadership on March 18, 2017 in Calgary was published in the March 28 edition of the Morinville Free Press. 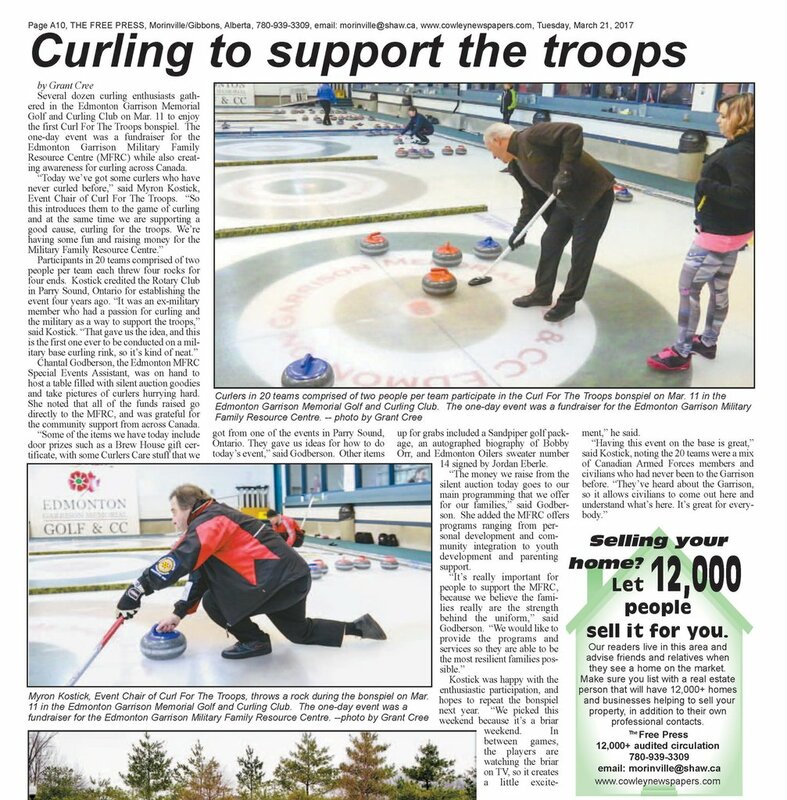 My curling fundraiser story featured in the March 7, 2017 edition of the Morinville Free Press. The second group of soldiers with 1 PPCLI who were deployed to Poland on Operation REASSURANCE arriving home on Wednesday, 1 March 2017. Click on the photo above to watch my 3-minute video. More than 100 soldiers from 1 Canadian Mechanized Brigade Group (1 CMBG) arrived at Edmonton International Airport on the evening of Friday, 24 February 2017. They were greeted on the tarmac by Colonel Bill Fletcher, Commander of 1 CMBG, and volunteers with Edmonton Salutes who served Tim Hortons coffee and treats. After being processed by members of the Arrival Assistance Group, they boarded several buses and went to Edmonton Garrison where they were reunited with loved ones in the Lecture Training Facility. Click on the photo above to see my gallery. On the evening of February 9, 2017, I had the privilege of covering the opening of a 14-foot snow monument dedicated to the 100th Anniversary of the Battle of Vimy Ridge. Event organizers with the Edmonton Silver Skate Festival partnered with Veterans Affairs Canada to create the commemorative snow monument. Soldiers of the Loyal Edmonton Regiment with Lori Sigurdson, Minister of Seniors and Housing and Edmonton Mayor Don Iveson at the opening ceremony of the Vimy Ridge snow monument on Feb. 9, 2017 at Hawrelak Park in Edmonton. Click on the photo above to see my gallery. Graduates and supporters of the Bold Eagle Aboriginal youth program gathered on November 19, 2016 in the Kingsway Royal Canadian Legion. The annual Appreciation Feast was hosted by the Aboriginal Veterans Society of Alberta. The event was their way to share camaraderie, present awards, and enjoy a lively performance by the Metis Jiggers. I had the honour of serving as the Bold Eagle Public Affairs Officer for five summers at CFB Wainwright, and can tell you it’s an excellent 6-week program. Click on the photo above to see my gallery. Here's a link to my video page, scroll down until you see "Bold Eagle 2016 Feast".